We want your child to have a great exp-hair-ience. Whether your kids are squirmy, scared, or super silly, our accomplished stylists know how to keep them entertained and engaged while they get a great haircut. Our stylists are adept at making kids feel welcome and comfortable and can turn your vision for what your child’s hair should look like into reality in no time flat. We understand that every family is busy, so we work efficiently with the goal of making your child look great every time you visit. When you're ready, so are we. We're a walk-in salon, so no appointments necessary! Your little one is adorbs! His or her first haircut is a moment to treasure. Getting a first haircut is a rite of passage. We’ll make sure it’s a fun experience, too. Our stylists are experts in making even our littlest customers comfortable and excited about this big step in their lives. 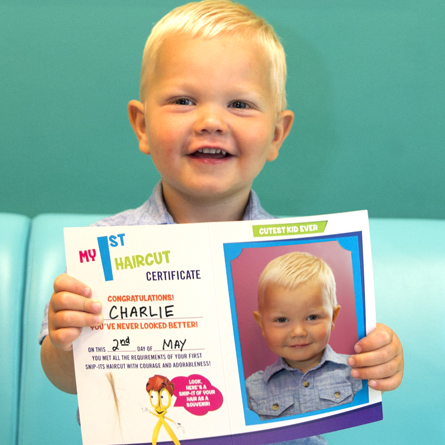 We’ll help you celebrate the moment with our First Haircut Photo Package, a fantastic keepsake that captures this special moment at the salon and includes a special place for a souvenir lock of hair.